Dragonlets and Me is from Delicious Doodles Digial Stamp and was one of the freebies from the Progressive Digi Challenge at CDAC. 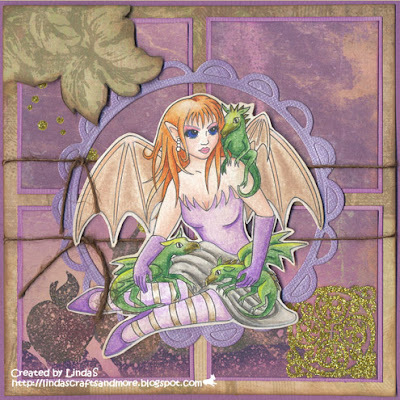 The Ribbon Girl - Colour Challenge #12 ... Lilac and Green. This is beautiful Linda! Lovely!!!! Thanks for using my image!! Beautiful image and card. Thanks for joining us at The Hybrid Chick Card Caravan! Altså Linda når jeg ser dine kort så tænker jeg virkelig at det er rene kunstværk. De kunne jo være billeder man kunne ha hængene på væggen så flotte er de! wow...awesome job on the coloring of your image! thanks so much for playing along with us at The Hybrid Chick!